I HAVE been agonising as to whether I publish this post. In mid December 2014 I was about to hit the button to introduce Mullens Street Burgers/Cafe to the world. The cafe is just a short walk from where I live but back in December I noticed the corner cafe has been closed for over a week. That didn’t seem too unusual as painters had been there the week before putting on some fresh paint inside and out – colourful cartoon murals now added some fun and gave the place an extra vibe. It also proudly sported the predominant colours of orange and black – the colours of the mighty Balmain Tigers as its owner, Marcello Biondi, was a huge Tigers fan (and everyone knew that). Sprucing up a joint usually means business and life is positive and I wanted to get an updated photo of the new-look Mullens Street. As I approached the cafe it was unusually devoid of activity. I thought maybe it was closed maybe to get rid of that freshly-painted smell or Marcello was planning a grand re-opening for the start of summer and to launch the new look. As I approached I noticed bunches of fresh flowers outside the building – almost always a sign of bad news. There was a note on the door – at the young age of 39, Marcello ‘Cello’ (as he was fondly called), had passed away and the cafe was closed until further notice. 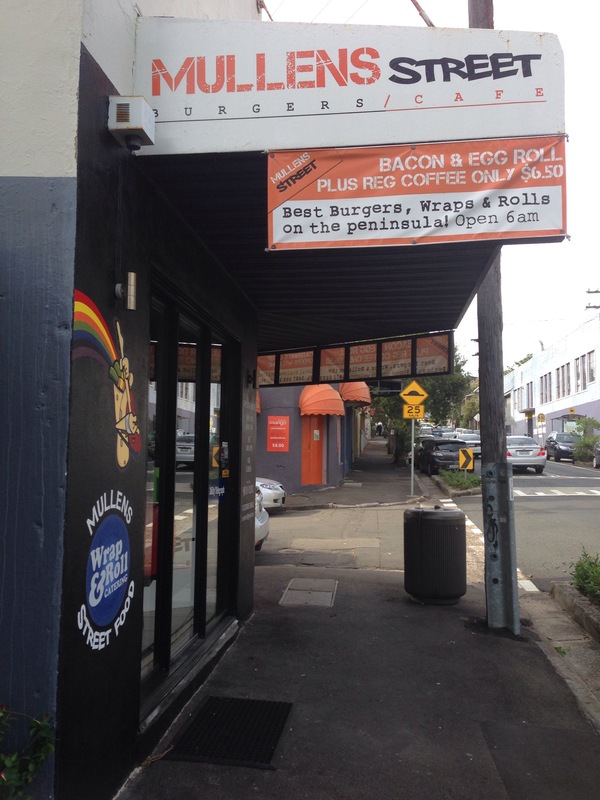 Mullens Street Burgers/Cafe made one of the Peninsula’s best bacon and egg rolls. For $6 you got the roll and a damn decent espresso coffee. And you could get one from 6am. But it was Cello’s burgers that were the stand out – they were big, juicy and satisfying and they turned him into a local legend. Back in December I wanted to tell you about Cello’s Tradie Burger – the best honest, hearty, manly burger in Sydney. Forget all those fancy ones out there – this was your proper old school fish ‘n’ chip shop style ones you used to get back in the 70s and 80s. The Tradie Burger ($8) was the quintessential Aussie burger – a seasoned flattened beef patty with bacon, lettuce, tomato, beetroot, fried runny egg, fried caramelized onion and barbecue sauce – all on big a Tip Top hamburger roll. It was as tough, sunburnt, robust (and thick?) as any Aussie tradie (without the dust, sweat and stubbies). 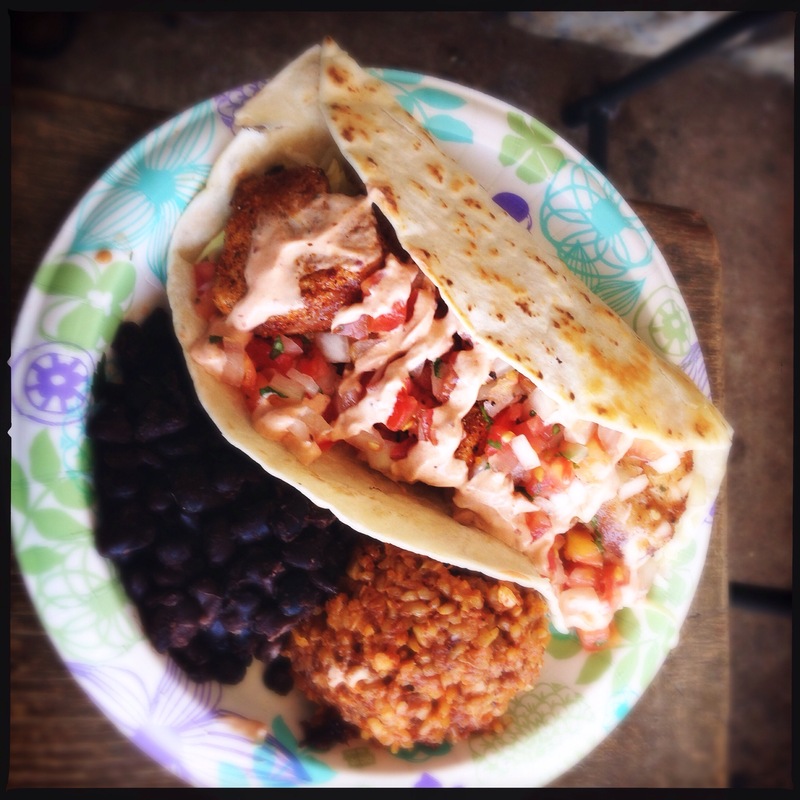 Cello also did a mean pulled pork roll with chili slaw and other sensational burger and wrap creations. 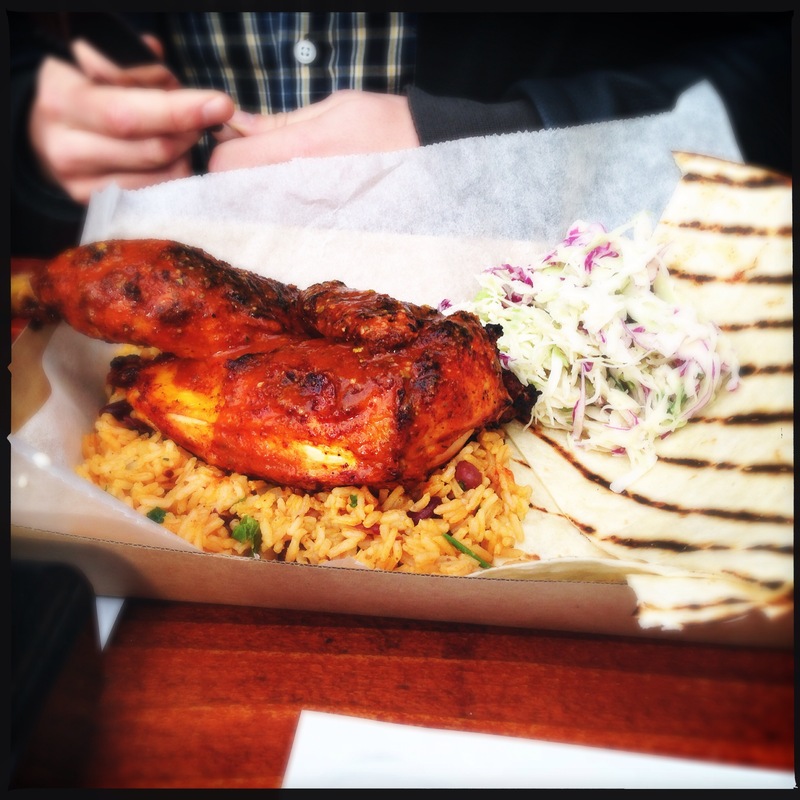 It was always difficult for customers to choose from the excellent Chicken Caesar wrap or the per-peri chicken one. The Tradie Burger was the pinnacle but also satisfying was the Big O Burger with huge onion rings and the Lamb Burger which had tender marinated lamb, fried onions, roasted capsicums and aoli. I have been hoping that Mullens Street would reopen – maybe by Cello’s staff or family to carry on his legacy, his humor and his spirit so that you too could share in the joy of having runny egg yolk and barbecue sauce running down your hand while getting your mouth around the Tradie Burger. Sadly it seems that it won’t be. I noticed a “For Lease” sign on the building the other day and that’s why I have finally decided to share Mullens Street with you and the tragic loss of another Balmain legend. Sadly, Marcello has passed but long live his memory and that of his Tradie Burger. The verdict: The Mullens Street Cafe boasted as having the best burgers and bacon and egg rolls on the Balmain Peninsula. It wasn’t wrong. 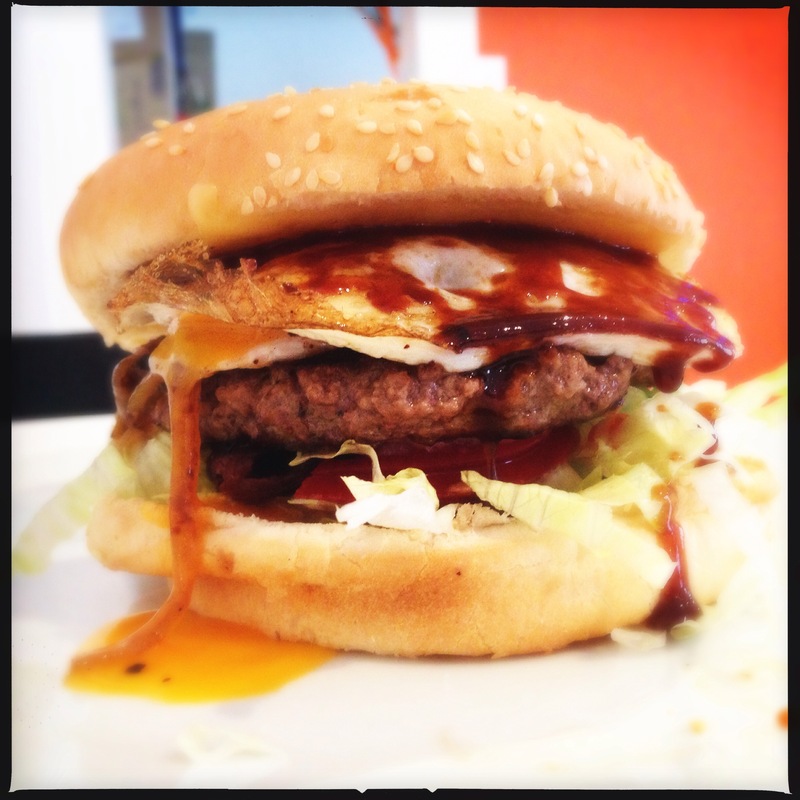 What: Mullens Street Burgers/Cafe, 135 Mullens Street, Balmain, NSW, Australia. Dedicated to Marcello Biondi: 2 November 1975 – 4 December 2014. IT WAS a bit disconcerting seeing my favourite food court – Dixon House – in Sydney’s Chinatown, in slight disarray with empty stalls and for lease signs scattered about the place the other day. Food court land can be a do or die affair, unfortunately. Thankfully, the aunties at two of my favourites – Phnom Penh Teo Chew Noodle House and Won Ton Noodle House – are still there as they have been for over a decade dishing out great bowls of noodle soup, stir fries and braised dishes as has Sizzling and Hot Pot Kitchen which still attracts what seems to be an endless queue of diners that linger around other folks trying to get a seat or table in the main communal dining area. I ventured down to Dixon House for lunch recently after reading a post about a ramen hole-in-the-wall called Ramen O-San Bar by Sydney street food bloggers Shawn and Alison of B-Kyu. I haven’t been to Dixon House for a while and as ramen is classic comfort food for me, it was a good incentive to pop my head in to visit this old Asian street food stalwart on Dixon Street mall. Ramen O-San Bar is the newest joint for Chef Kazuteru’s who has six other such shops in the world (five in Japan and one in Cambodia). The stall immediately on the left as you enter through the sliding doors of Dixon House on the Hay and Dixon streets corner (next door to Phnom Penh Teo Chew Noodle House). Its menu is displayed on a huge banner hanging near the service window (which makes me think that Ramen O-San Bar may have been at a market or two), and features a variety of ramen as well as some other dishes (to the right there was a large pile of charsiu pork rice balls for $3). There is tonkatsu ramen ($9.80); sumo ramen (pork and chicken soup with pork kakuni); black garlic tonkatsu ramen ($10.80); spicy ramen ($11.80); seafood tsukemen ($13.80) as well as some rice bowls (pork belly and charsiu pork). You can add extras to your ramen bowl for a small cost (like an egg, bamboo shoots, leek, shallot, nori, etc). I love tonkatsu ramen and I measure ramen joints on the quality of this style of ramen. 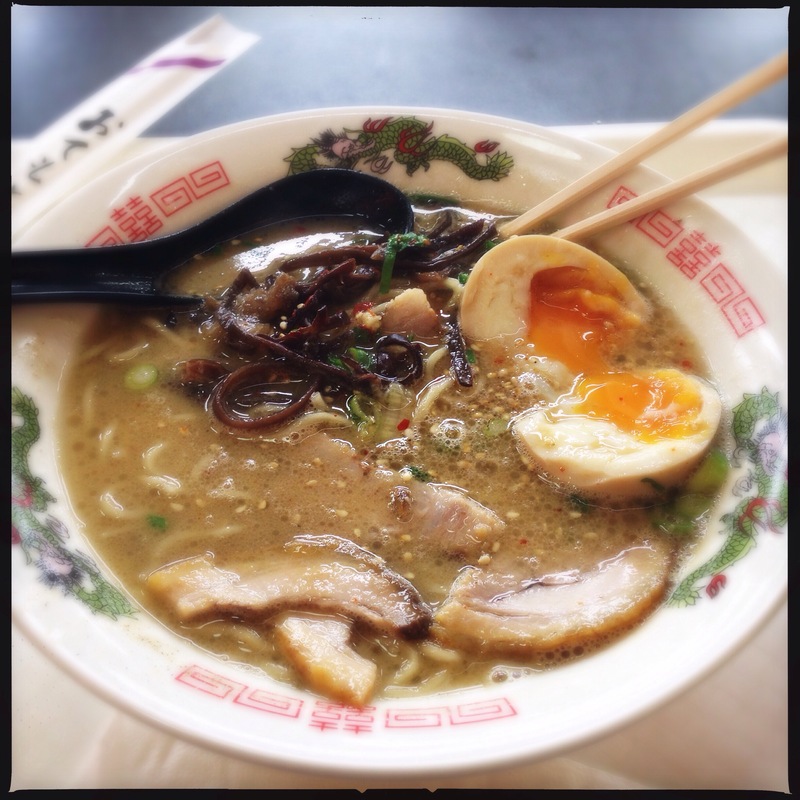 For ramen acolytes, this style of ramen broth is like Dom Perignon to a Champagne connoisseur. Tonkatsu is a cloudy white-coloured thick broth made from boiling pork bones for many hours which infuses the soup with a hearty pork flavor with a creamy consistency. Sometimes other lighter stock might be added to for the final stock soup. I ordered Ramen O-San Bar’s tonkatsu ramen ($9.80) with the addition of a soft-boiled egg (in Japan it’s called onsen tamago), for $1.50). The bowl took just over five minutes to be served (I assume as the onsen tamago was being bathed). It was a hearty, nutty and creamy, lip-smacking, collagen-enriched pork broth. Classic to the style. In the bowl was a topping of sliced spring onions, shredded wood fungus and slices of pork. The noodles were firm. I added about half a teaspoon each of sesame seeds, minced garlic and chilli flakes (available at the the stall), to the bowl after my initial couple of slurps just for a flavour boost. Did it need it? Probably not – but I am a creature of habit when it comes to adding such tid bits to my ramen (don’t worry, I did taste the soup before adding my extras). The onsen tamago was excellent and almost perfect – it had a runny orange yolk and was a fine addition to the ramen. Maybe I should have also ordered a nori sheet and some menma? Next time. This ramen hit the spot and ticked all the boxes. The only thing that I could criticise was the lack of extras – you need to build your own from a base (as in Japan) but in OZ there are other ramen places where you get a little bit more (such as nori and menma). But considering the quality of the broth – extra bells and whistles are only an after thought. With a line starting to form outside Ramen O-San Bar as I left I hope its popularity reinvigorates my favourite food court. 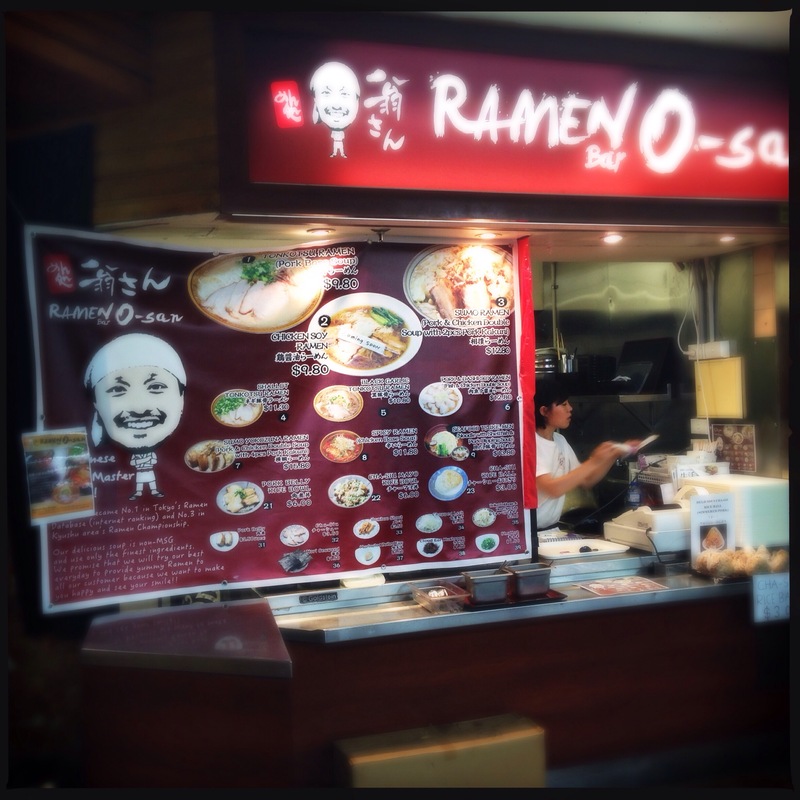 The verdict: Ramen O-San Bar has one of the best food court tonkatsu ramen in town and is worthy of a place alongside the much raved about Gumshara (Eating World Food Court) and Ramen Ikkyu (Sussex Food Court). What: Ramen O-San Bar, Stall B1 at Dixon House Food Court, cnr Hay and Dixon streets, Haymarket, Sydney, NSW Australia. The food court is open seven days a week from 10.30am to 8pm (but some outlets’ openings vary). THE Little Champion (T.L.C.) has got involved in the market game and is one of the organisers along with two mates – a passionate Frenchman and an enthusiastic foodie – of Sydney’s newest produce market in the leafy inner-eastern suburb of Woollahra. She texted me last week as she needed my help with her hubby and my best mate REG aka Real Evil Genius. REG was a bit out of character (he was apparently going “all gourmet”), and she asked me to come along one Sunday and catch up with him at the market for “an intervention”. If it was true that REG was “going all gourmet” then she was right to start worrying. You may remember REG from a previous blog. “Gourmet” for REG is wearing a bib while breaking into a chilli crab sipping his cocktail of choice (either a shandy or a West Coast Cooler). I confronted REG over the phone. He confessed that ever since T.L.C. and her mates started the market he would return home each Sunday afternoon with bags full of jars of granola, cheeses, French pastries, artisan breads and flowers. To my surprise he was getting a taste for a salad mix from the providers of all things leafy to none other than restaurateurs Tetsuya Wakuda and Neil Perry. The Baronets of Balmain and I caught up with REG and his daughter, Little Nipper, at the Woollahra Artisan Market on a recent sunny Sydney spring Sunday. 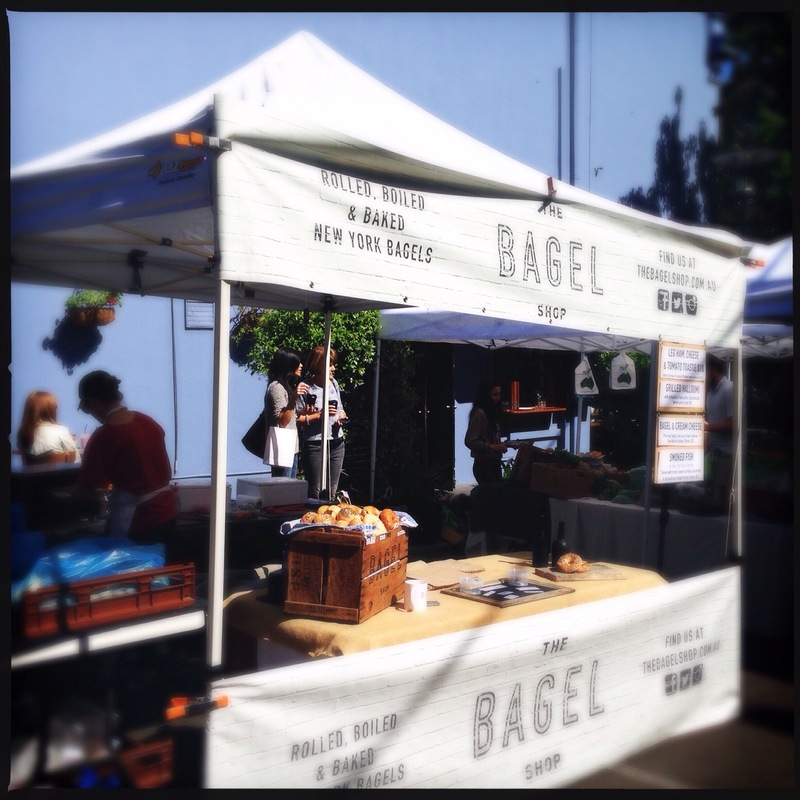 It’s a small market tucked behind Zigolini’s on Queen Street and is reminiscent of the type of village market you would find in suburbs and villages of France. 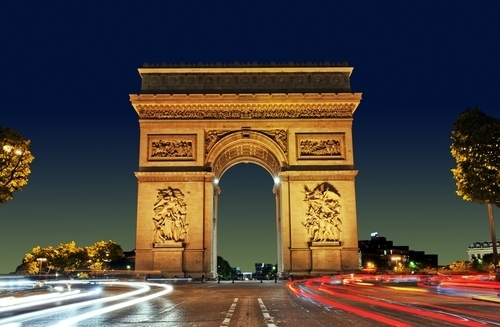 And that’s exactly what its creator, Woollaraha local Alain Schwerm, is trying to emulate. From what I saw, smelt, heard and experienced he is on the way to making this one of the best suburban produce markets in the city. The first thing that stood out when we arrived was that many of the stallholders (such as the elegant ladies that run the stall selling woven market bags and French linen), would greet you with an enthusiastic “bonjour” (in true French accents), giving this market a real Continental vibe. Secondly is the array and quantity of produce; and thirdly, not a bric-a-brac stall in sight. 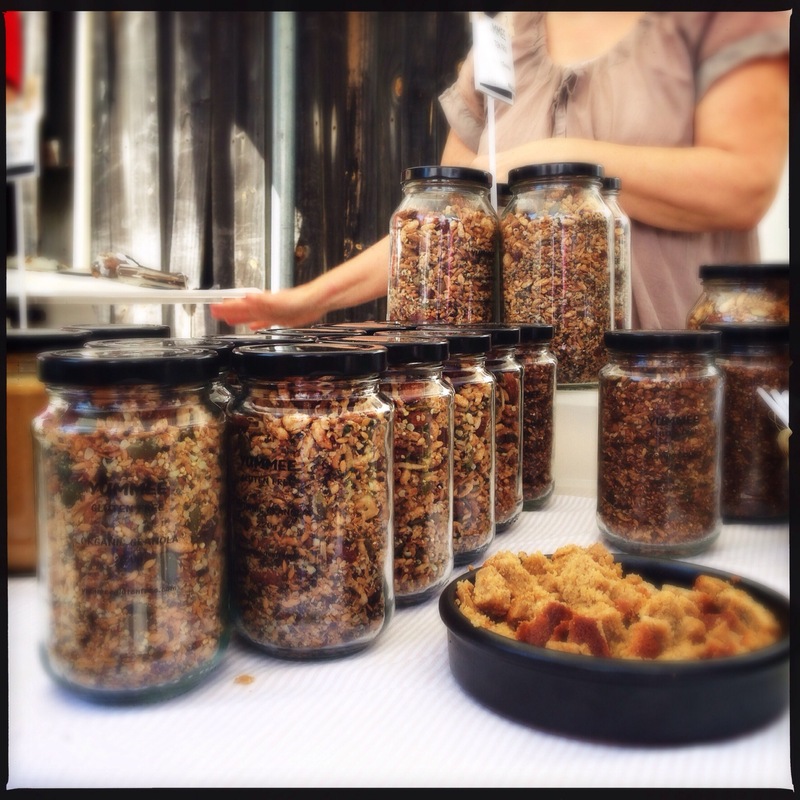 REG and Little Nipper wanted to take us to some of their market discoveries (I think REG couldn’t wait to try the samples as almost all stallholders had an offering to entice a purchase), so the first stop was “Yummee” operated by a family that made their own organic granola. The granola was good, especially highlighted when layered with the fruity compote that they also sold. The family also makes its own peanut spread (which would be excellent on top of some steamed veges Indonesian gado-gado style), and an almond paste. Yummee was in-between a young lad surrounded by bottles of a wine spritzer called “Sofi” and a couple of kids spruiking the health benefits of their bottled virgin olive oil from Rosto Grove in Merriwa up in the Hunter Valley. Rosto produces two varieties – a mild drop (Mellow) and a pungent beauty (Extra Oomph) which had lashings of banana and pepper tones. REG bought a bottle to send home to the Baroness. Next door was a stall managed by an extremely fit and health passionate women from “Running Hearts” who made her own protein balls and other healthy snacks. The Baronets consumed enough protein ball samples to satisfy Arnold Schwarzenegger and gave them the thumbs up (I am now watching to see if Gob and DJ Hoot bulk up in the next week). They insisted that I buy a box for the Baroness (so I did but I suspect it was a ploy to raid the box back at home). I then felt a tug at my jeans. DJ Hoot was pointing at sticks of salami opposite. You never get between DJ Hoot and fermented sausage – she’s a connoisseur of it and puts other eight year olds to shame when ordering pizza (with hot pepperoni every time). There were three styles of the Sicilian-inspired sarda for tasting. 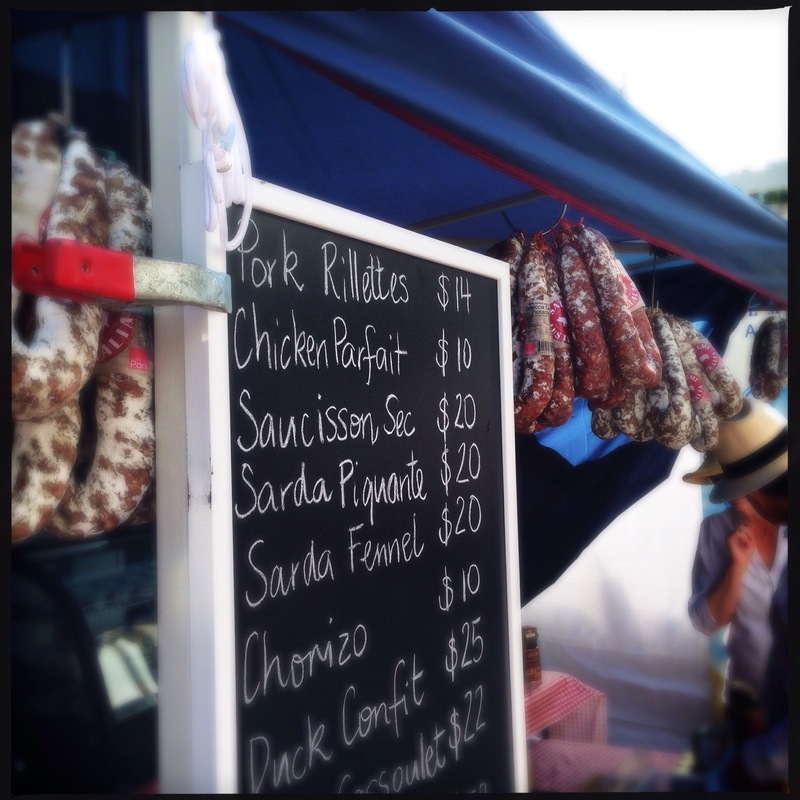 Also for sale was saucisson sec, pork rillettes and chicken parfait. To one side and on a grill were large chorizo sausages on sticks spurting out their spicy perfume of minced pig and chilli for sale as a snack. And that is where I lost REG. But not to worry, the sophisticated Frenchman Alain got me back on track. As we strolled he told me he wanted to create a real produce market like the ones back home – something he thinks is lacking in suburban Sydney (which is true as most of the established ones here are turning into outdoor dollar shops and flea markets). Alain said he got initial support from some of his French food-loving/making compatriots and proudly told me they had a stall selling the classic and rare Boudreaux pastry canelé (the recipe dates back to the 1700s), and a stall (La Planchette) that had about 20 imported cheeses including comté cheese. He spoke excitedly of the stall owners who made the effort to bring fresh fruit and veg from places like Dural and Vineyard and other artisans giving the market a go. The emphasis on produce (and being slightly selective on who they have), has worked. 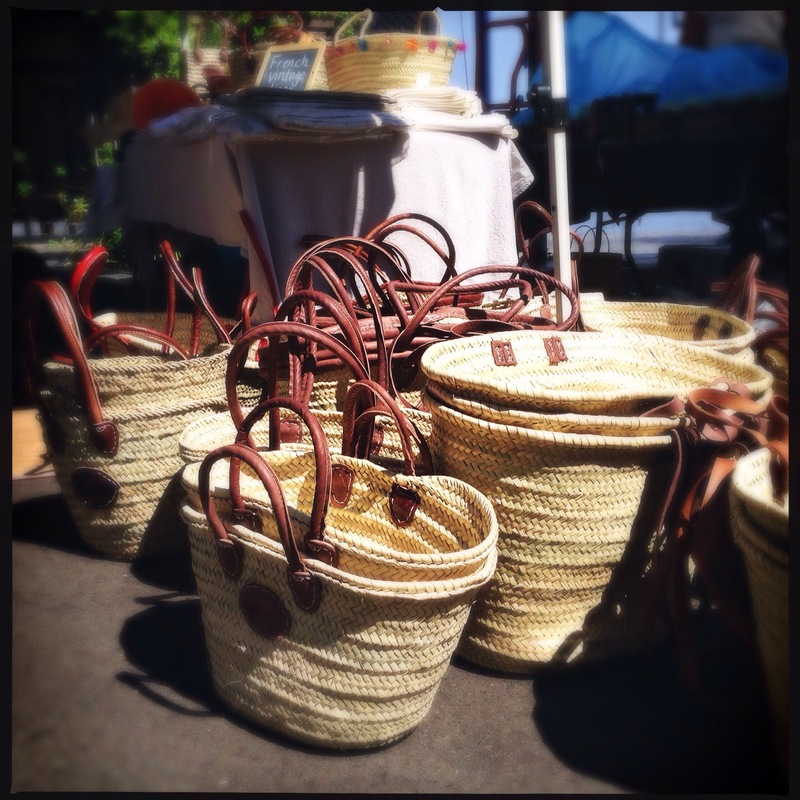 The small group of French foodies have been joined by other select producers selling good old cottage-industry wares which a proud Alain said was extremely satisfying and encouraging as it will help to make the market a permanent fixture. As we chatted we stopped outside a food cart operated by Bar Phở. Alain could tell that the irony of having a Vietnamese street cart selling noodle soup in a “French Market” was not lost on me. “You see we even have French Indochina represented,” he joked. 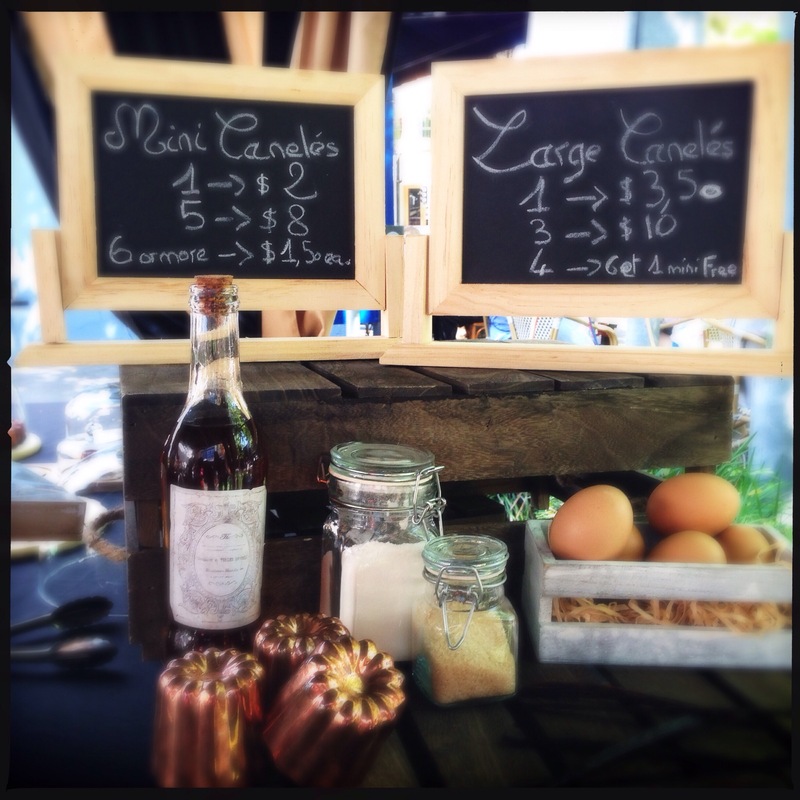 I caught up with REG and Little Nipper at “By Constance” which was home to the famous canelé. These delectable sweet pastries can be sampled and must be tried. A canelé is a small, airy pastry with a soft custard center and a dark caramelised crust. One of the nicest sweets I have had in a while (think of a marriage of creme brûlée and panettone). Taking home a packet was a must. Next door was “Common2Us” from Dural with a selection of quality fruit and vegetables. 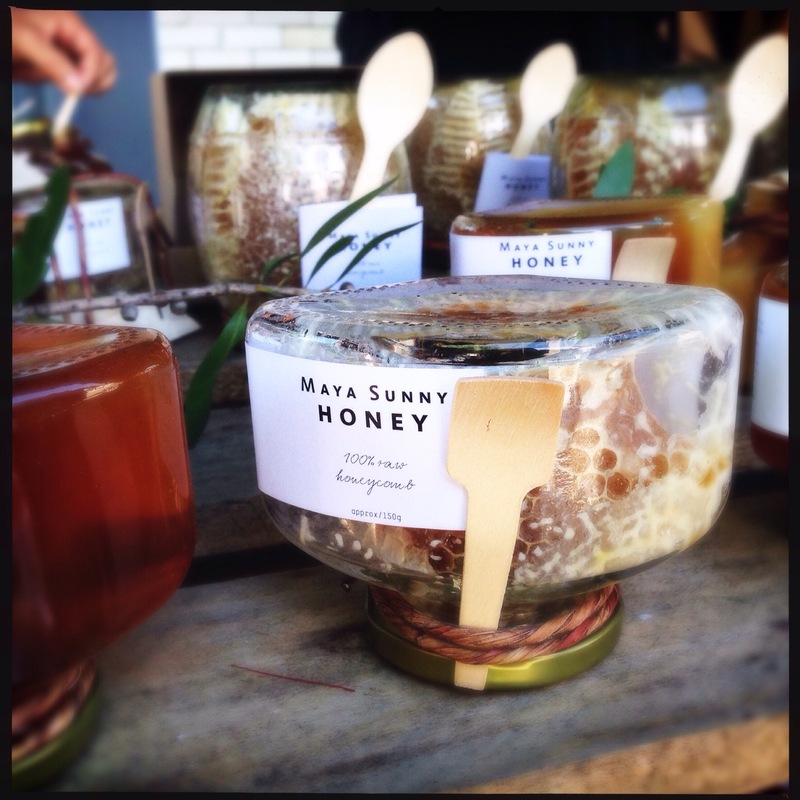 Across the way the Baronets were studying the huge jar of bees busily making honeycomb at the Maya Sunny Honey stall. 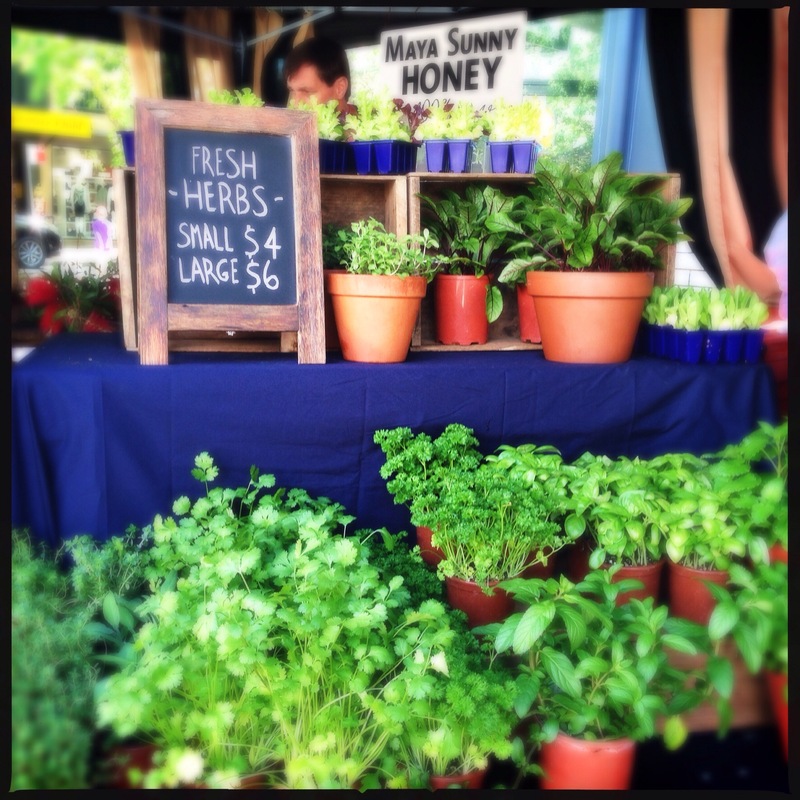 Next door, salad merchants “Salads Direct” were selling fresh herbs in pots and bags of salad mixes ($5). I grabbed a bag of these wonderful washed and crunchy leaves which I was told would last for a week in the fridge. I got six individual serves out of the bag and the Rosto olive oil was the dressing of choice at evening meals. My final purchase of the day was a jar of “Take2Eggs” lemon butter from a lady next to Phở Bar. It has been an excellent accompaniment to some freshly-toasted banana bread and is similar to a spreadable rich lemon curd. She also had some jars of preserved lemons and an organic orange marmalade. With bags in hand we caught up with T.L.C. and Little Nipper buying bread and chocolate croissants from the Organic Bread Bar. REG also appeared and told me he had just knocked off a grilled chorizo on a stick. He had a big glob of reddish fatty goodness seeping into his shirt as proof. “Should’ve asked for a bib,” I told him. Next to REG, as if they were his prized possessions, were two cases of the Sofi wine spritzer which he said he had just bought. I turned to T.L.C and whispered: “Situation normal, no intervention required”. The verdict: Produce driven market with the vibe and sophistication reminiscent of a local community market in a small French provincial town. Will make its mark in Sydney. I THOUGHT I had just walked into a scene from the movie Deliverance. 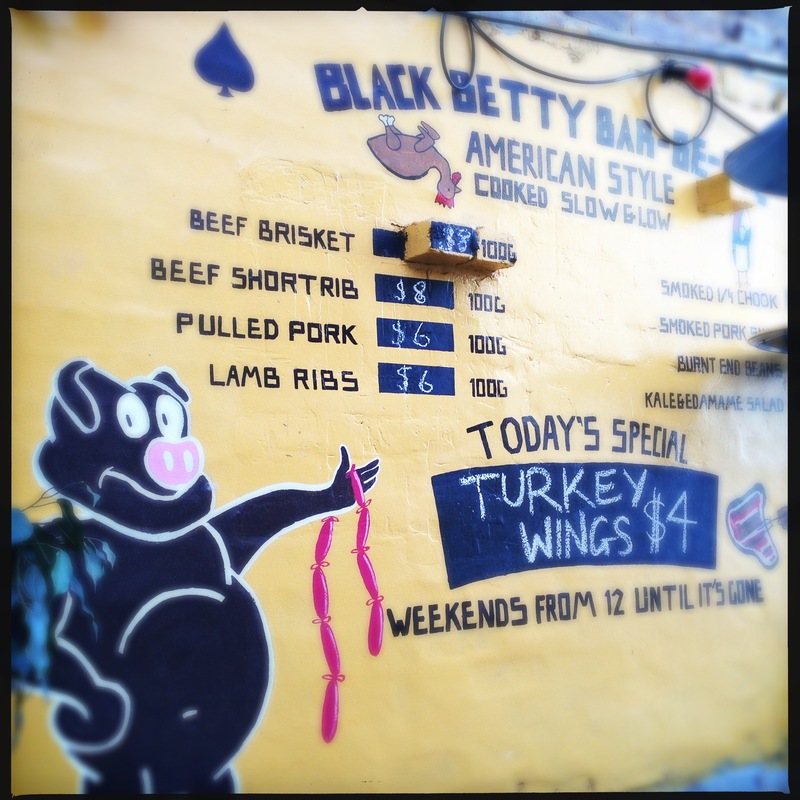 I am greeted by a picture of a large black pig amid a haze of hickory-scented smoke bellowing from the outside smoker which was imparting flavoured carbon goodness to various meaty delights within its steel coffin. Moving inside to the bar area there, standing before me where pole dancers used to gyrate under a disco ball, was a wooden cheetah kept company by a nearby stuffed bear. It seemed a bit odd – the animals didn’t seem to fit in with the rest of the Bayou backwater swamp come retro club theme which mesmerised us after the fog of the hickory smoke lifted but the bear was a handsome beast and stood proud as a stuffed animal can. Not so long ago Oxford Tavern wasn’t the place you would go for a decent feed (of food). With a neon sign flashing “girls, girls, girls” throughout the wee hours of the morning, it was the kind of place that Sinatra would go to for a late night swill to be among bucks parties and “dirty old men types” ogling pole dances, strippers and jelly wrestlers while being served by barmaids with not much on. But one could feel safe as the local Police station is directly across the road (and possibly in pre Wood Royal Commission days The Oxford served as a “lunch room”). The Petersham pub has thrown out the jelly wrestling tubs and while that infamous neon sign and the stainless steel dancing polls are still there it has been transformed into a groovy retro-themed pub serving micro brew beer served by guys that look as if they have come out of a truck stop on Route 66 and some pretty decent food inspired by Southern US BBQ revolutionaries and Tex-Mex rancheros. I attended The Oxford for lunch with some colleagues after a nearby work-related site visit and if you like meat and smoke and BBQ then The Oxford is the place for you. Inside you could be forgiven if you think you are dining in Albuquerque or, if you choose a table outdoors, in a South Carolina or Tennessee BBQ house where the smoker billows away quietly in a corner. The menu features pub meals with a twist and some American BBQ and Tex-Mex-inspired delights such as a cheeseburger ($5); chook san chou bow ($15); popcorn squid ($16); fries from $8; and then there’s five styles of tacos for $5.50 each (fried pork belly; Baja fish; Asudo short rib, BBQ Chicken and fried avocado). 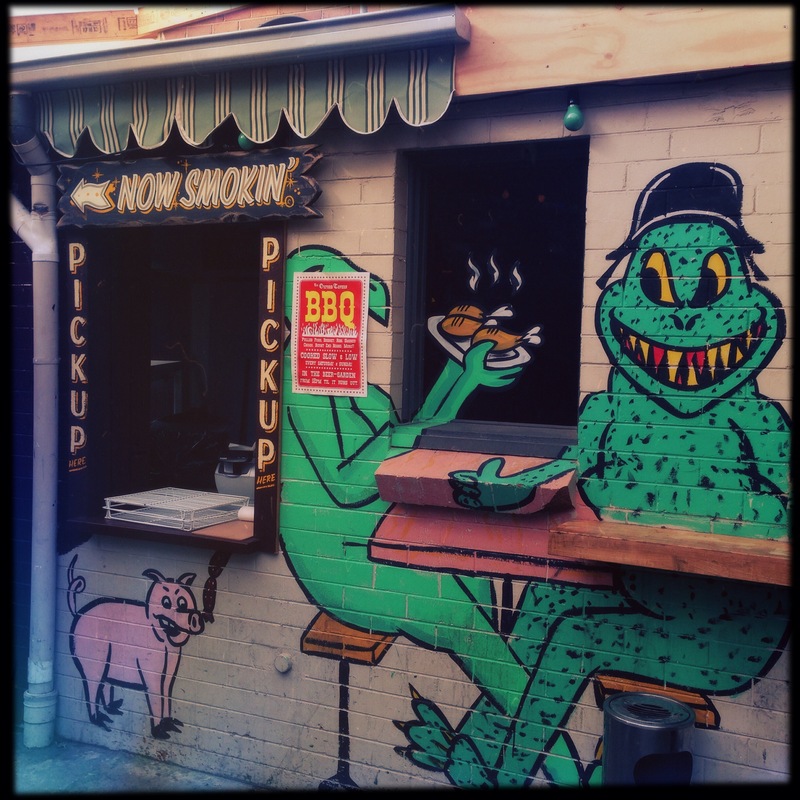 On weekends they sell a variety of smoked BBQ meats per 100g until it is all gone. It’s not all meat, there are a items for non-carnivores such as BBQ corn with a Creole mayo, popcorn and chips ($8), and buffalo cauliflower balls with hot sauce and blue cheese sauce ($14). But it is the $10 lunch menu that is the eye-opener and was the talk of the table and the reason that we will be back (and we can’t wait). The lunch menu is available Monday to Friday from noon to 3pm and features 19 of the main menu items – BBQ pork roll; a stadium double dawg, hickory burger, Dino’s Charcoal Chicken and much more. Thankfully the six of us all ordered something different so we could all get a feel for what The Oxford could do. Signorina Prada (aka La Fille avec le Téléphone d’Opale), ordered the Stadium Double Dawg – a grilled hot dog that looked as if it was over half a metre long and dressed with corn relish, onions, mustard and tomato sauce and came with a side of chunky fries (which we picked at while Signorina was out on the phone for the second time). 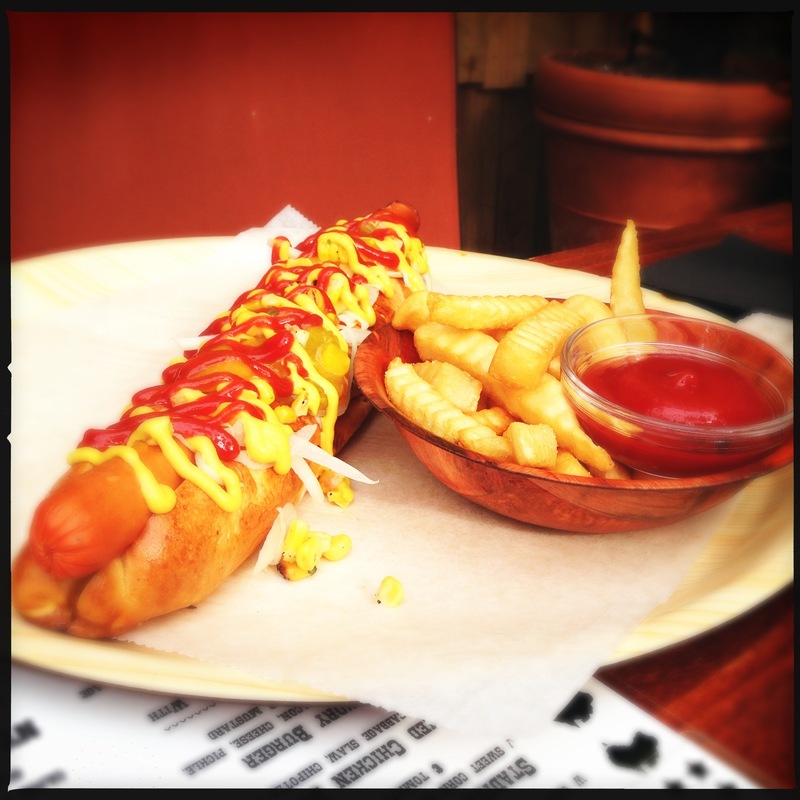 You can also get it as a chilli double dawg. More about the jelly wrestle later. Heracles always needs a protein fix. 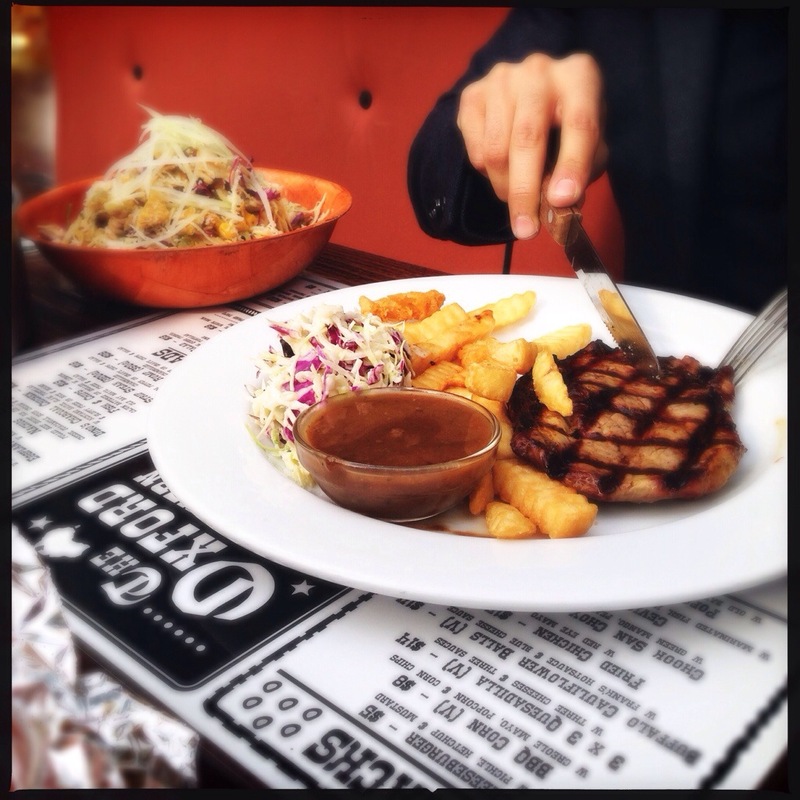 Not one to order small and to up the ante, he decided to get two $10 meals – the steak and the chicken salad. The steak came with a side of slaw and chips. Obviously the plain English drafting seminar wasn’t lost on Heracles. 3. A colleague might take a picture of you eating something that your trainer will hold against you. Thankfully no one died in the eating of the schnitzel. The Apprentice, as you may recall, is a man with a little tummy. He shies away from meals bigger than a 20 cent piece (that’s just over the size of an American quarter). He ordered the hickory-smoked pulled pork roll much to my amazement (I guess it was to impress upon Heracles who The Apprentice has a self-admitted man crush on). 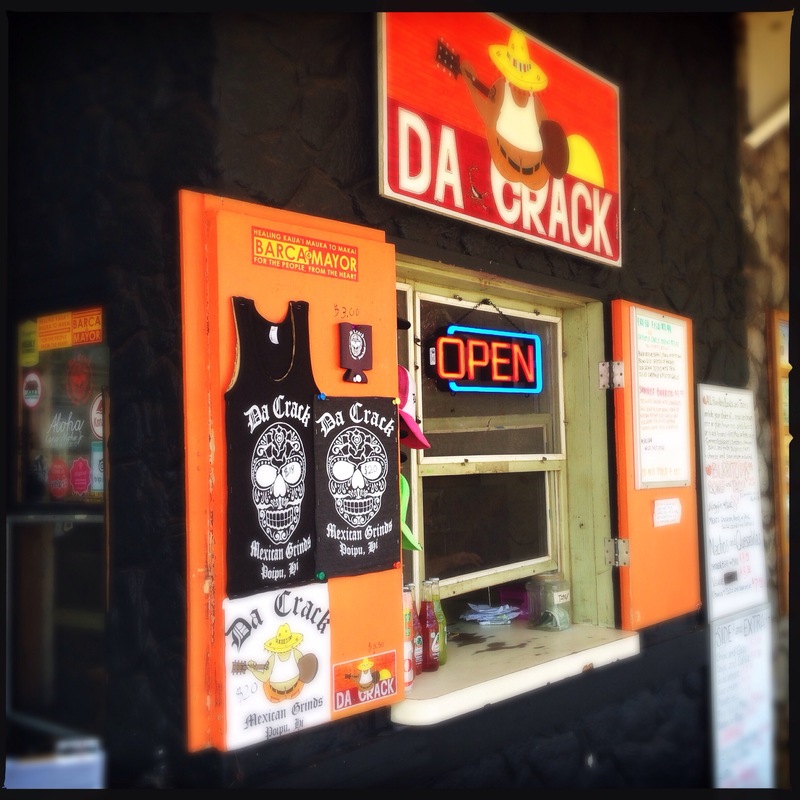 He stepped up to the challenge and devoured his pork-filled bun with ferocity. To everyone’s surprise he then enthusiastically declared that he was up to the task of sharing the Oxford’s signature dessert – the jelly wrestle – with his colleagues. Me Julie was more concerned that he may start eyeing off her half-eaten schnitzel and would have to fight him for it (sans jelly). I’m enjoying the current Sydney burger fad and just had to opt for the hickory burger. Out it came in a foil covered basket. It contained a moist, hickory-smoke flavoured, lean pattie with a strip of bacon topped with cheese, tomatoes, dill pickles and hallelujah . . . . . . . .mustard! It was all served up on a fresh soft bun. This is what a burger should be – not too complex or saturated with condiments. 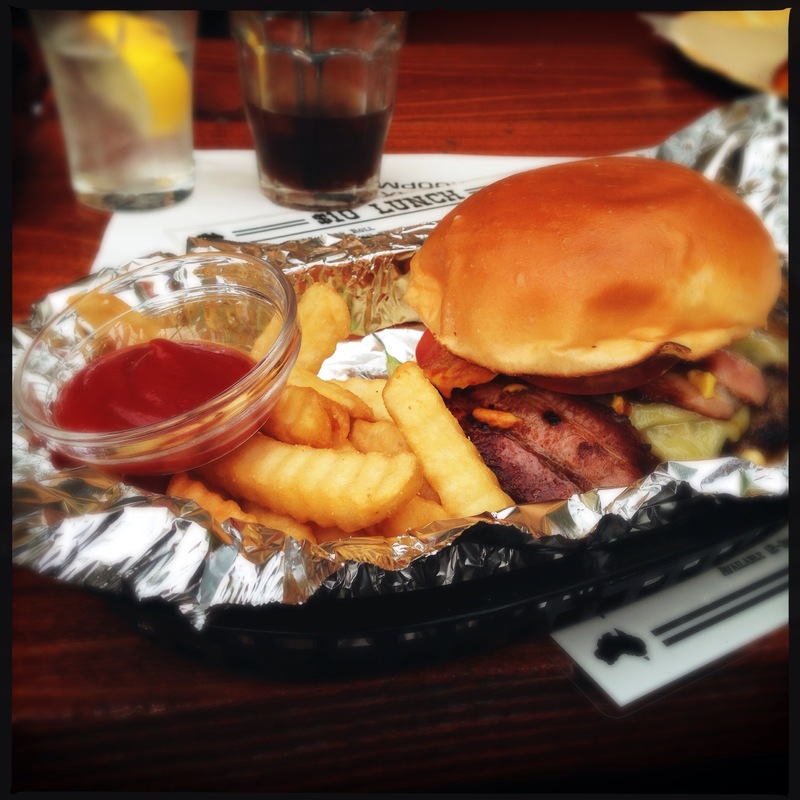 An excellent burger and fries were not an optional extra (like in other establishments). It would receive a mighty “Yee Ha!” in the Lone Star State. A dab of El Yucateco chilli sauce or smoky Tabasco from the bottles on the tables was an excellent addition (if you want Tex Mex then that needs to include such condiments so 10 out of 10 to The Oxford). Finally we were lucky enough to be able to order the Jelly Wrestle ($20) which isn’t usually on the lunch menu. 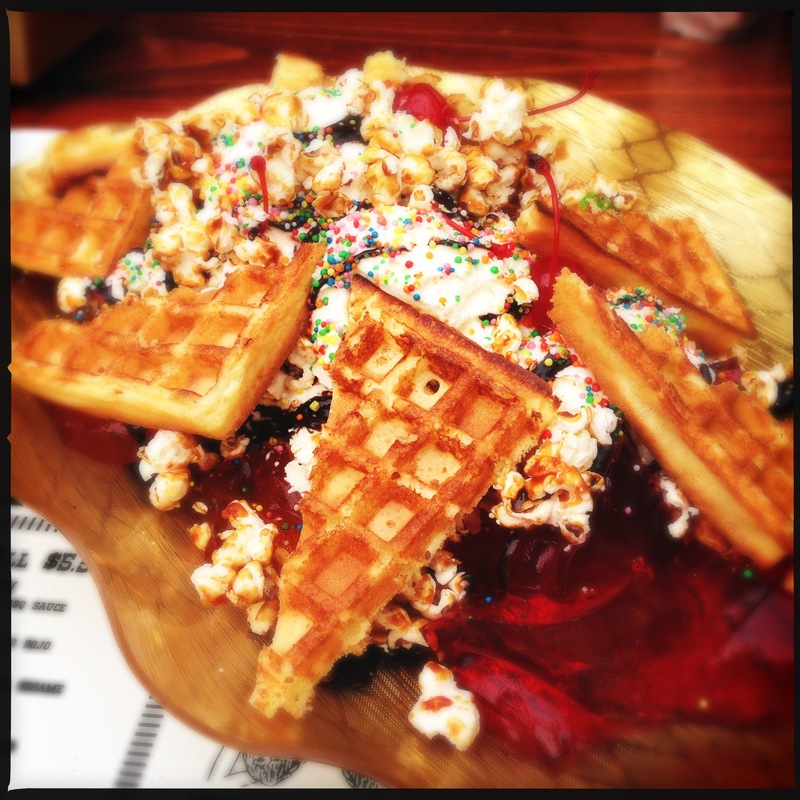 The Jelly Wrestle is a huge wooden platter of four different flavoured jellies with ice cream, caramel popcorn and wafers all topped with chocolate and raspberry sauce and whipped cream. A couple of glace cherries make a feature too. The dessert doesn’t come with cutlery – you done latex gloves and go in scooping out as much as you can eat. We had to remind Me Julie that the ‘wrestle’ in the name was to do with an activity that used to occur at The “old”Oxford and not a declaration to fight over the dessert with the winner taking all (this didn’t stop her from keeping a fork at the ready). At The Oxford we wrestled and we scoffed, and like it was like for those patrons during the halcyon days of The Oxford we left with cheeky grins on our faces. *Note: a “skewy” is Australian slang for a “schooner of beer” and is not a reference to certain acts dramatised or suggested in the movie Deliverance. The verdict: With 19 $10 lunch time options, smoked meats, a hot dog a long as an elephant’s tail, dancing poles, good beer and a dessert called the “Jelly Wrestle” served up by wild men in trucker hats what more could you ask for from a pub? 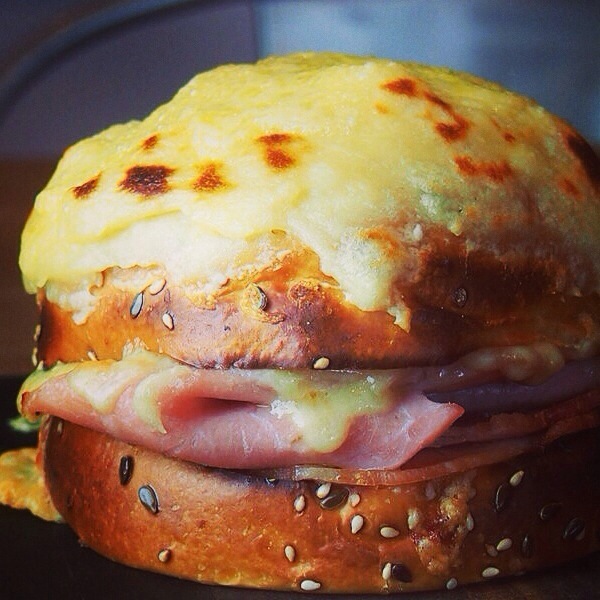 WITH the Tour de France in full swing and today begin Bastille Day my aptly named Bastille Burger is inspired by the classic French bistro toasted ham and cheese sandwich – the croque monsieur. The croque monsieur is a grilled or fried ham and cheese sandwich (Gruyère or emmental cheese is usually used) with the top of the sandwich having a layer of béchamel sauce on it. Thought to have originated in Paris cafes back in 1910, it is found throughout France and is served as a snack or casual meal. 1 tbsp of herbes de Provence (if you can’t get these then equal parts of dried tarragon, thyme and oregano). Gruyère cheese (grated) (about 3/4 cup). Mix the mince with all the burger ingredients. Once mixed thoroughly (don’t over knead or the burger will be tough), divide into six or eight patties. Make a small oval depression on the top of each patty so when the burger cooks it rounds out evenly. Start making the béchamel sauce by adding the butter in a small saucepan on low heat and melting until foamy. Add flour and cook, stirring constantly with a flat sauce whisk until smooth (about 2 minutes). Slowly add milk, stirring continuously and cook until the mixture thickens – enough to coat the back of a spoon (about 2 minutes). Remove from heat and season with salt and pepper to taste. Stir in Parmigiano and grated Gruyère. Reserve until ready. Toast your halved burger buns and set aside ready for assembly. Wrap the slices of ham off the bone in aluminium foil and warm in a moderate oven. Grill your burgers to your liking. Make sure the grill is hot and you oil the grill. Place each burger on it – a high heat will ensure a good crust around the burger. Avoid flipping too often or pressing down on the burger as you want to keep all the flavour and juices inside. 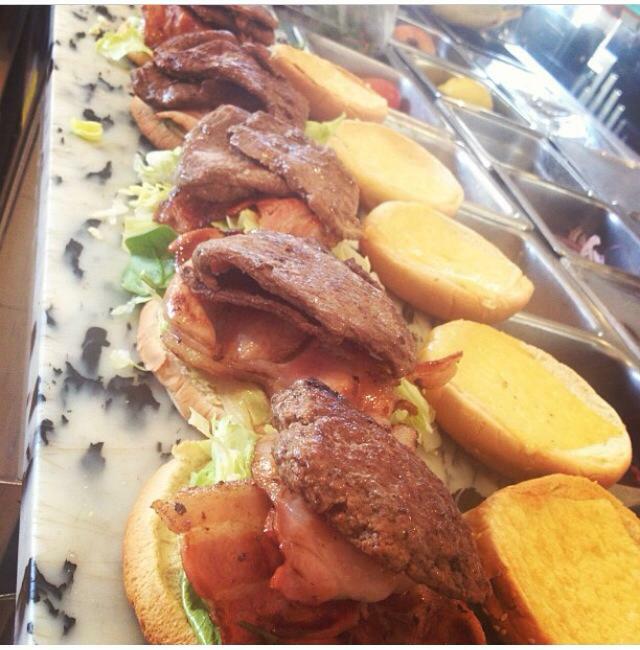 Like with all meat – allow the burgers to rest. Take top burger bun and add a good layer of béchamel on to the top and place again under the grill to allow béchamel to slightly brown. Spread the toasted bun halves with béchamel, dividing evenly and extending all the way to the edges. Assemble the burger with the remainder of the ingredients from the bottom bun by adding the warmed leg ham, Dijon mustard, burger, Gruyère cheese, sliced pickle and top with the other bun half. Serve with a side of fries. ON my walk to work the other morning I suddenly developed a laksa craving after I passed Kopitiam Cafe on Harris Street at Ultimo – a small cafe that has been at the site since 1999 serving up Malaysian staples to homesick Malays. I used to work five buildings down from Kopitiam Cafe in the late ’90s and I had always meant to go there (but the attraction of Sydney’s Chinatown just down the road was even more inviting to a young HBV who had just moved to the Big Smoke). So, after 14 years I finally made the effort to take another stroll down Harris Street one lunchtime and pop into Kopitiam hoping to get an authentic laksa. Kopitiam Cafe is just up from the powerhouse Museum and has a very interesting menu featuring street food hawker dishes as well as an array of Malaysian specialties. Aside from the usual char kway teo and beef rendang there is claypot loh see fun (which translates to ‘rats’ tail noodles’ as the noodles are round and fat and are stir-fried with dark soy, pork mince, pork fat, chili and bean sprouts), as well as nasi lemak, and fish head curry. I was here for laksa so some of the other tempting dishes need to wait for another occasion (hopefully not another 14 years). When thinking of laksa I always anticipate the Singaporean/Nonya style. 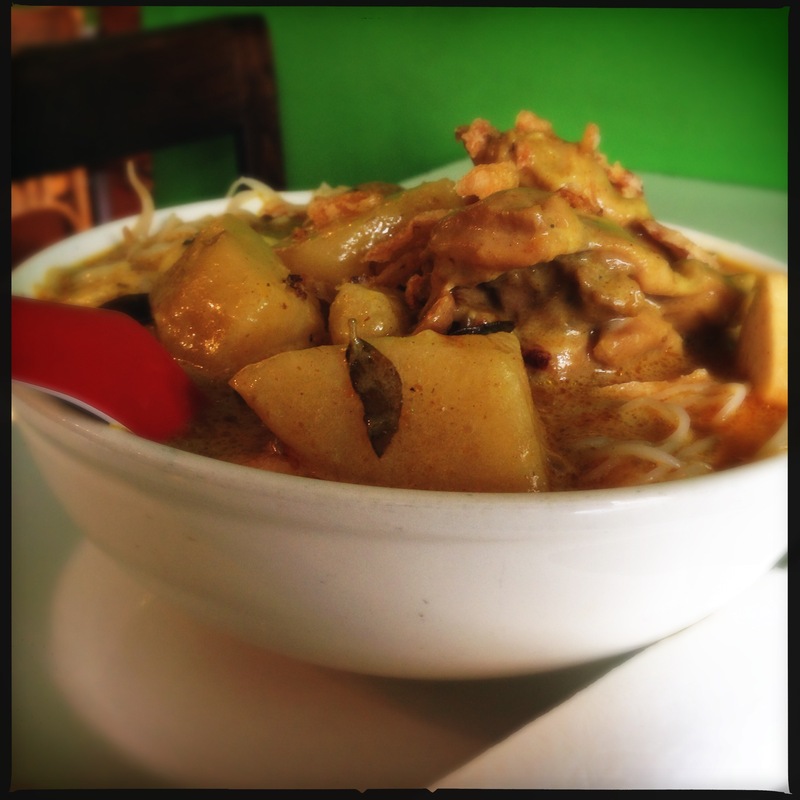 Kopitiam’s chicken laksa ($10) is more curry mee (and it wasn’t what I was really expecting). Curry mee is the Malaysian curry laksa and there are different versions of it. The “laksa” came out less than two minutes of ordering. It was a large bowl with a lot of thin rice noodles topped with blanched bean sprouts, half a boiled egg, fried tofu and large chunks of curried chicken and potato. It was if the last two ingredients may be interchangeable between the chicken laksa and Kopitiam’s chicken curry. A lot of effort has gone into the soup – it was rich and creamy with a nice curry flavour with pieces of curry leaf (there were even a couple of bits of curry leaf stem in it), as well as fried onions. Alas there was not enough fiery chili heat – a good dollop of sambal would have been nice. It would be interesting to see if there is any similarity between the laksa soup and the curry chicken gravy. Kopitiam’s chicken laksa was a very filling dish with good flvours but was not what I was expecting – it was more a soupy Malaysian chicken curry with noodles. The verdict: I prefer the Singaporean/Nonya style of laksa but with the crowds of Malays and a menu featuring street dishes you thought would be only available in Malaysia, it is clear why Kopitiam Cafe has been around for 15 years. Will be back to try the Malaysian specialties. 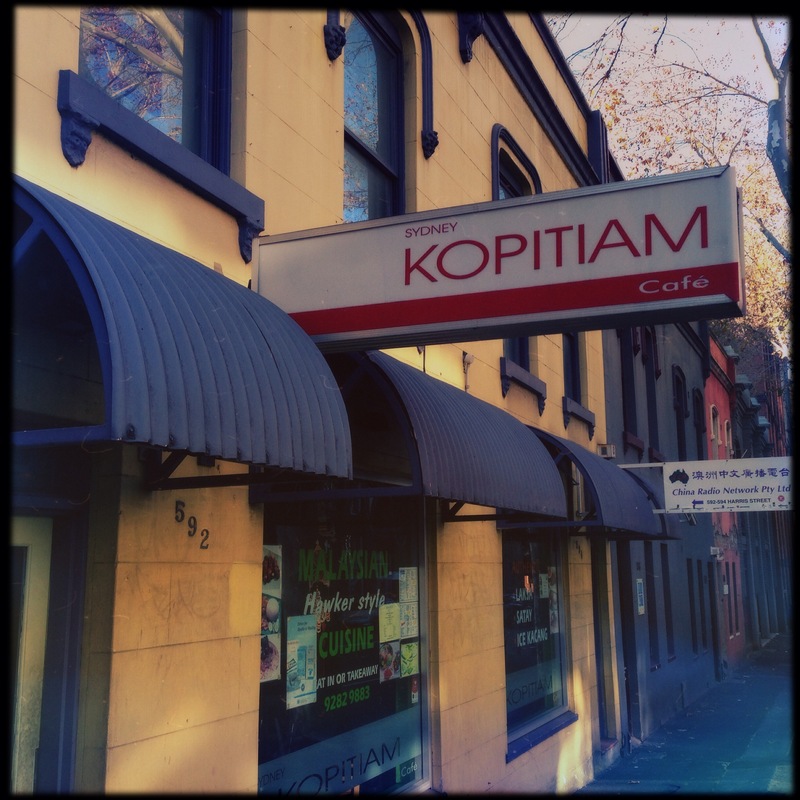 What: Kopitiam Cafe, 594 Harris St, Ultimo, NSW, Australia. Open seven days from noon to 3pm.